Guinea pigs are herbivores that will consume almost anything that resembles a plant. However, the key is to provide proper nutrition, and Hartz® is here to help. 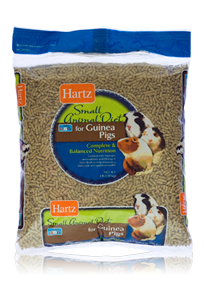 Hartz® Small Animal Diet for Guinea Pigs is a special blend of carefully selected ingredients designed to meet the nutritional needs of Guinea Pigs. A diet fortified with vitamins, antioxidants and omega-6 fatty acids will help to maintain optimum health and shiny coats.